India- South Korea Relations have been strong since decades. The two countries share a lot of similarities in almost of the aspects. These aspects may be cultural, business, trade etc. The year 1973, witnessed formal establishment of ties between the two countries. Agreement on Trade promotion and economic and Technological Co-operation (1974), Agreement on Co-operation in Science and Technology (1976) and Bilateral Investment Promotion/ Protection Agreement (1996) are some of the agreement between the two countries. There is no doubt on the grounds that India and South Korea share healthy and warm relations. Over the past years, India- South Korea Economic Relations have seen extremely appreciated growth in the sector concerned. After the implementation of Comprehensive Economic Partnership Agreement (CEPA), the trade relations between India and South Korea shot up. There was a rise from $12 billion (as in 2008) to $20 billion in 2011. Not only this, India has maintained restricted investment environment in front of foreign investors in the country. At the same time, India is greatly relaxed in case of South Korean investments. This is because of the same Comprehensive Economic Partnership Agreement between the two countries. A Joint Trade and Investment Promotion Committee at cabinet level has even been established. During the year 2012, India purchased eight warships from South Korea. 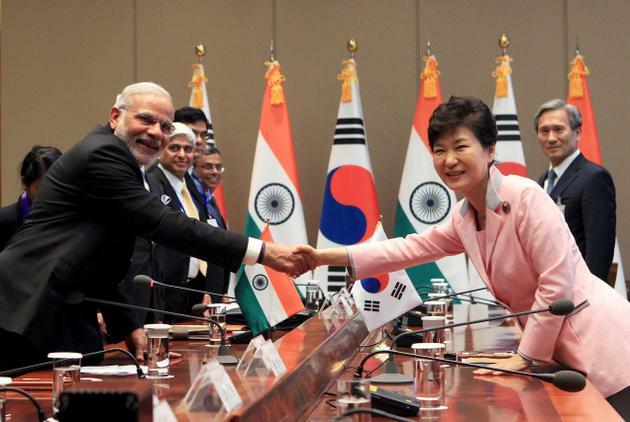 With the improvement of foreign relations, much attention is upon the relations between India and South Korea. Since 1991, South Korea has been an enthusiastic investor. The country maintains to confine its confidence in India’s potential, which is indespensable to sustain any relation. The Indian Geography which is indeed an emerging global power in itself. India is not only rich in emerging growth in the marketplace and increasing proportion of middle class population. But also its geographical conditions ensures stability to Korea. The Relations between the two countries have absolutely been beneficial to both. South Korea has been looking for partners for its space program. It is very clear, India’s cost effective space launches, were not only “cost effective” only, but greatly SUCCESSFUL as well. These qualities have attractive to Seoul, especially after the tremendous success of Chandrayaan and GSLV launches. This greatly contributed to the implementation of agreement between Indian Space Research Organisation (ISRO) andKorea Aerospace Research Institute for the cooperation towards peaceful uses of outer space. Not only this, the two countries have also agreed to establish India- ROK ICT Policy Forum. Under this, they will discuss cooperation on software and information security. Do you know about the India Korea Bilateral Relation? Well the bilateral trade saw a hike by 40% as compared to that in 2009. The South Korean companies like Samsung, LG and Hyundai we know, are the best Korean companies present in the Indian market. They diver amazing customer satisfaction by means of their excellent quality. It fetches them intense respect in the marketplace, and will continue to do the same in future too! So, what do you think will be the future endeavours of this ongoing healthy and fruitful business relationship? The answer to the question is quite obvious, the two are to grow, deepen and ultimately flourish their relations. Both the countries are looking forward to expand their partnership even more. They are deepening the political cooperation, economic engagement and of course.. mutual Cultural Understanding which is vital to sustain the warm friendship between India and South Korea.